Large hopper design, it can hold 7L materials at a time. It can make 3-5cm, 5-7cm and 7-10cm donut by changing mold. The hypertrophy of donut can also be adjusted by material amount. It adopts precise orbit devices and import motor to maintain a minimum shock. Digital thermostat on this donut machine makes operation very convenient and easy to supervise the process. Easy to operate,you just put material into the hopper, set it up and turn it on,the machine will work itself. The machine requires that the current of working environment circuit is above 28Amp. If less than 28A, we don't suggest you to buy this machine, because it will keep tripping the breaker. And Buyer is responsible for the shipping cost if item returns due to this reason. The whole machine body is made of food grade 304 stainless steel, it is durable and safe for use. It is a fully automatic machine,such as molding, temperature control,frying,turn the donut and output are all automatic. It adopts screw-type adjustable device, the discharge port can be up and down according to the height of oil level. Come with 3 sets molds sizes: 3-5cm,5-7cm,7-10cm; the productivity of the small donut is 500pcs/hr and the large donut is 300pcs/hr. 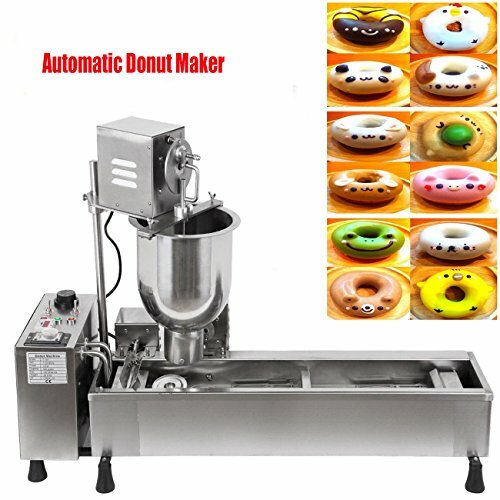 The automatic donut maker makes donuts with the shape of round hollow ,it is perfect for food-making in catering industries and home.